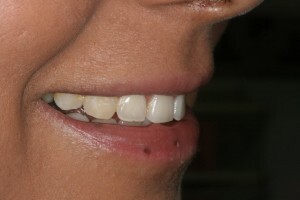 Reshaping your teeth is a simple and conservative way of improving the appearance of your teeth. If a tooth is slightly long or angled out a little, re contouring is a quick and effective way of correcting the position of the tooth in a matter of minutes. 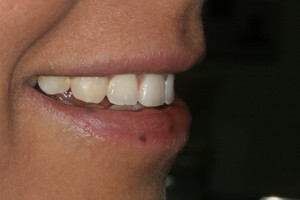 Tradition methods involved dental veneers or orthodontics, which can be time consuming and expensive. With re contouring a tooth we use small sand paper discs to slowly correct the position of the tooth, each time we take a tiny amount of tooth away and show the client until they are happy. This way we take the smallest amount of tooth away giving the best results. 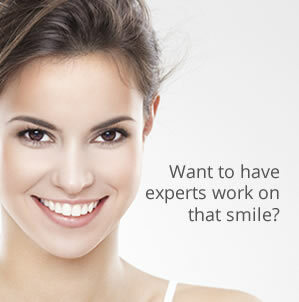 If you need lots of move tooth movement or reduction then we recommend traditional dental veneers or invisible orthodontic treatments we do. 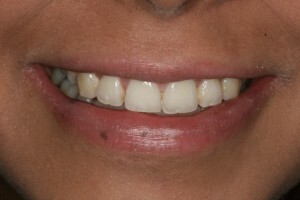 In this case this young lady was initially unhappy with her teeth and had a course of Invisalign invisible braces by our Orthodontist Dr Qureshi. 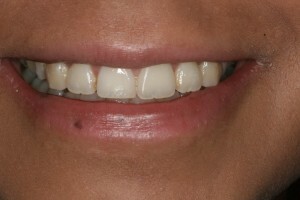 After braces she was unhappy with one prominent tooth the upper left central incisor that still flared out naturally due to its shape. We simply contoured the tooth in with sand paper discs and you can see it looks much better and the treatment took 10 minutes.